[S45] Website FreeBMD (http://freebmd.rootsweb.com/) "Births Jun 1901 Roberts Maggie Warrington 8c 267." [S1051] Website Lancashire BMD (http://lancashirebmd.org.uk/) "WELSBY Elizabeth DEAN Joseph 1864 Warrington, St Paul Warrington Cheshire C27/5/355." [S1088] Website Lancashire OPC (http://www.lan-opc.org.uk) "20 Feb 1780 Nehemiah s. to John & Betty Kelsal of Burtonwood farmer." [S1088] Website Lancashire OPC (http://www.lan-opc.org.uk) "8 May 1785 Isaac s. to John & Betty Kelsall of Burtonwood farmer." [S1088] Website Lancashire OPC (http://www.lan-opc.org.uk) "8 Aug 1773 Hannah d. to Jno & Betty Kelsal of b. farmer." [S1088] Website Lancashire OPC (http://www.lan-opc.org.uk) "3 Mar 1776 Ellen d. to John & Betty Kelsal of Burtonwood farmer." [S1088] Website Lancashire OPC (http://www.lan-opc.org.uk) "26 Oct 1777 John s. to John & Betty Kelsal of Burtonwood farmer." [S1088] Website Lancashire OPC (http://www.lan-opc.org.uk) "27 May 1787 Thomas s. to John & Betty Kelsall of Burtonwood farmer." [S1088] Website Lancashire OPC (http://www.lan-opc.org.uk) "27 Oct 1782 Richd s. to John & Betty Kelsall of Burtonwood farmer." [S2302] Index of Baptism in the Parish of St Peter (Hartshead), 1813-1836, "21/2/1819 William Armytage son of George and Sarah Pratt of Clifton, card maker." P009081 1612 - 1812 0496808 Film 0471891 Film." 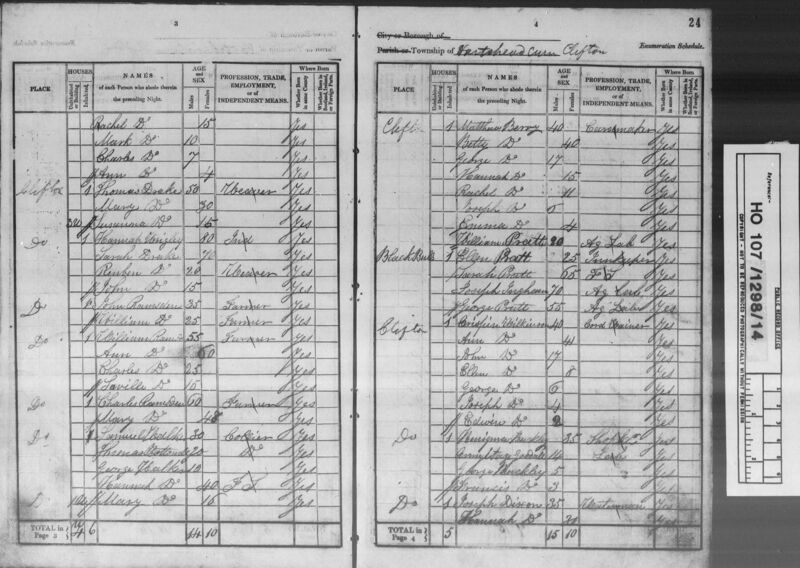 [S47] UK National Census for 1861 for UK, "RG9/3276 f71a p6 28." M107711 1814 - 1845 0990592 Film 6909686 Film." [S2305] Webpage Baines 1822 Clifton (http://www.genuki.org.uk/big/eng/YKS/WRY/Dewsbury/…) "Pratt George, vict. Black Bull."